The third edition of the Expat Fair is around the corner and we are going back to where it all started! See you on Saturday the 19th of November starting with 12.30 at The Ark for a day full of information and inspiration! 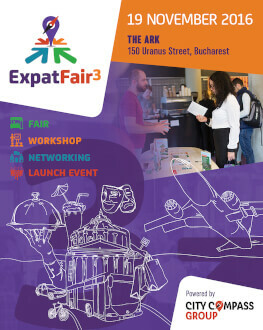 The Expat Fair is the only event of its kind in Bucharest - the first large-scale meeting point for internationals and services tailored to their needs. The event will also celebrate the launch of the 9th edition of the travel and expat guide City Compass Romania: Bucharest & Beyond starting with 18.00 and will bring together around 200 guests – readers, expats in Romania, dear clients, collaborators, friends and event partners. The launch of the City Compass Guide is an excellent occasion to meet, mingle and network in an intercultural environment. Expat CEOs, entrepreneurs, expat group members, department leaders of the TOP100 companies, diplomatic representatives in Romania, representatives of the Chambers of Commerce in Romania, consultants, foreign investors, international schools and guest writers. All the workshop topics and the agenda will be announced soon. Read the full descriptions here. *In order to book a seat at one of the workshops/the panel or confirm your attendance at the networking event please buy a ticket beforehand. In order to get your ticket press Buy next to the type of ticket you are interested in (general admission, one person or family). Then you need to either create an account with your e-mail address and set a password or directly login with your Facebook account. The information you provide is confidential and will only be used to receieve your ticket and additional information (if the case). Then login and check-out. You will receive your ticket via e-mail. Use the code under the barcode on the ticket to subscribe for workshops, the panel and the networking session on the same website after pressing Book a seat next to the ones you are interested in. You can book several sessions. See you soon!